For decades, rural and small-town America has been left at the sidelines of academic analysis and evidence-based policy discussions. Big city issues and interests have defined America’s most pressing social problems, but the election of Donald Trump to the presidency has been characterized as rural America reasserting itself with a vengeance. The rural-urban divide seemingly has never been greater, but sound science tells us that the rural-urban interface—where capital, labor, people, information, and material goods flow back and forth between rural and urban America—is increasingly difficult to describe and define. A binary view of urban versus rural America is an impediment to addressing economic underdevelopment and the shared political and social interests of the nation. 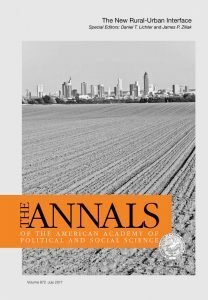 Rural and urban interests are interdependent, so this volume of The ANNALS provides evidence on the rural-urban interface as it is manifest today. Research here reveals what empirical science can tell us about the geographic, political, and social dimensions of the ruralurban interface today. The volume begins with a comprehensive and accessible orientation to the rural-urban interface. The editors give concrete definitions of rural-urban boundaries, and then discuss the ways in which those boundaries are shifting (typically outward, through suburbs, “exurbs” and beyond), how they are becoming increasingly permeable in terms of internal migration and social/economic interdependency, and why the boundaries that separate rural and urban people are sometimes clear, but more often difficult to define. One study shows how outlying rural areas in metropolitan Atlanta have been enveloped by the incursion of urban people spreading outward from the central city. Another study documents the extraordinary recent increase in racial and ethnic diversity across America’s urban hierarchy, a change that has transformed many predominately white cities and suburbs. 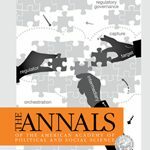 Another study establishes that immigration promotes new patterns of interdependence in rural and urban America: the back and forth movement of new immigrants between locations stitches together communities and families, and makes economic forecasting for immigrant-receiving communities difficult. The economies of rural and urban labor markets are highly integrated and interdependent. A study here shows that the local benefits of self-employment and entrepreneurship often trickle down from America’s largest metropolitan employment centers to other labor market areas, including rural ones. Another study uses that Supplemental Poverty Measure to document rapid declines in poverty over the 1967 to 2014 period that have been especially prominent in nonmetropolitan areas, owing in large part to the economic transformation and growth of many small and remote communities. Another study presents the case for new qualitative approaches to measuring poverty, including a concrete proposal for a “qualitative census,” currently in development. A study of intergenerational mobility shows great variance in economic opportunity across the rural-urban continuum, but also establishes that economic mobility is influenced by geographic location. Among other findings, this work shows that patterns of intergenerational mobility in “micropolitan” areas (nonmetropolitan counties with large urban places) promote upward mobility. Institutions of American democracy are changing across the rural-urban continuum. A study of the 2016 presidential election shows how red/blue voting boundaries are moving and that attitudes about the role or effectiveness of government are not monolithic across the rural-urban interface. Shifting voting patterns bring needed caution to big generalizations about a rural backlash. An assessment of regional governance highlights the problems of overlapping layers of government at the rural-urban interface and proposes new ways forward. In public schooling, work here documents changes at the rural-urban interface that lead to great disparities in school composition, achievement, and resources that likely reinforce spatial inequality rather than reduce it. Similarly, new research also documents how incarceration plays out along the rural-urban continuum, and that the penal and justice systems often reinforce spatial inequality in crime and punishment. Research here describes the early onset of obesity in America, documenting how, among other things, disparities in body weight, blood pressure, and other indicators of cardiovascular health drive higher rates of mortality in rural areas. Food insecurity is also unevenly distributed across geography as is public responses to the problem (e.g., charitable food banks), and work here shows that rural food insecurity can be effectively mitigated by urban interventions. Finally, a measurement of exposure to blighted communities and neighborhoods shows that urban blight has diffused to rural communities and the countryside. Abandoned and vandalized buildings have increased rapidly in suburban, exurban, and rural areas, and the social boundaries that have typically defined rural and urban areas are less clear-cut today than in the past. Overall, this volume argues for awareness that the things that unite rural and urban America are arguably more important today than the things that divide us. The symbolic and social boundaries that have traditionally defined rural and urban America are changing, and are ever-more permeable. 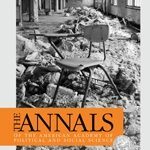 The new rural-urban dynamic in America demands new approaches to social problems and policies that recognize the strengths of both urban and rural approaches, and the way that the nation is organized administratively may ultimately reinforce old or outdated boundaries, making problem-solving more difficult. The culture and economy of America is increasingly fluid, and an old demographic portrait of a country that no longer exists must not define social science, and should not define our policy and politics.